The Saints actually had some big names signed to the roster. Names like Billy Kilmer and Doug Atkins. The Former LSU Tiger and Green Bay legend Jim Taylor would play his last season in New Orleans before being inducted into the NFL Hall of Fame. 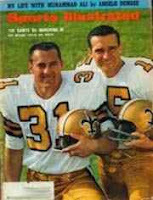 Taylor's team mate Paul Hornung had actually been chosen in the expansion draft also, but a back injury led him to an early retirement. For the defense, players like defensive end Doug Atkins and linebacker Steve Stonebreaker came on. I remember Obert Logan from that first season. He was number "0". He played Safety, was only 5'10" and when he retired ... so did the number 0 from the NFL. 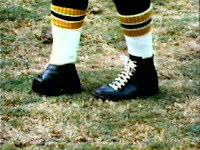 Tom Dempsey played for two seasons. He is widely known for his NFL record 63-yard field goal, kicked in the final two seconds to give the New Orleans Saints a 19–17 win over the Detroit Lions on November 8, 1970. It still stands today ... He also kicked with half of a foot. 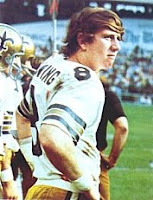 When Archie Manning played quarterback for the Saints during the 1980s, he was sacked more than 300 times. This year, for the inaugural John Madden "Most Valuable Protectors Award" ... the CURRENT offensive line sent the senior Archie to pick up the award on their behalf.